With this advanced GPS tracking device, you'll never lose your way. When you park it there and leave far, you can track your car by mobile APP to know where your car is. And the APP can be used to calculate the distance from the parking position to the place you are in. The compass can indicate the direction of your position. The APP can also navigate your parking location in real time via the mobile map. 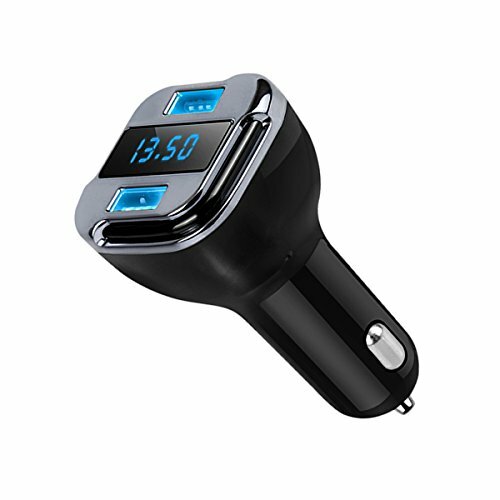 It is a smart quick car charger, compatible with all electronic devices with USB charging port.It adopts double USB interface design, can automatically identify various kinds of mobile phones/tablets. For the first time, you have to download the APP to the phone. Delicate Design and Multifunctional: OLED blue light display and real-time battery voltage monitoring. Inserted smart chip provides short circuit protection, over current protection, the load voltage protection and multiple protection. Smart Quick-charging: This USB car charger dual-port can automatically identify your device and provide the fastest charging speed. Two devices can be charged at the same time. Strong Compatibility: Compatible with Android/Apple mobile devices, including iPhone X / 8 / 7 / 6s / 5 / SE / Plus, iPad Pro / mini / Air, Samsung Galaxy s8 / S7 / S6 / Edge / Plus, Note, BlackBerry, LG, Nexus, HTC, Lenovo, Xiaomi, Moto, Huawei and Camera / MP3 / PSP. Charging Protection: Linear voltage compensation function let the charging speed more stable, stop automatically when the battery is fully charged. GPS Location Tracker: Connecting your mobile phone app with car charger, automatically finding the parking position. And when you do not know the exact position of your car, so simply open the phone app to find it.